Hey look at that…rain…all day and tomorrow. That is exactly what we don’t need right now with the ground as saturated as it is and the river and stream levels practically overflowing. 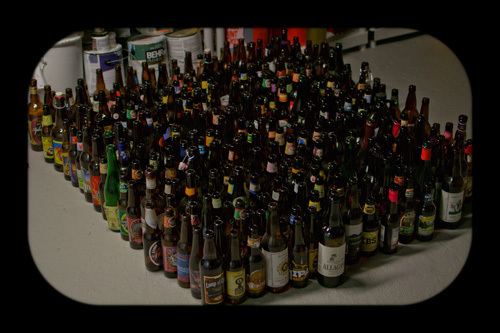 Looks like I will have to be keeping a sharp eye on the old sump pump…with beer in hand that is. 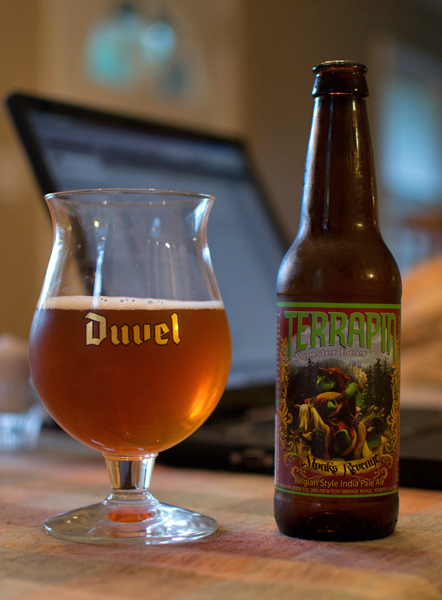 Beer #282 is Monk’s Revenge by Terrapin Beer Company. Haling from Athens, Georgia where the B-52’s also call home, this Belgian IPA has an ABV of 9.6%. Wow…with that ABV it will be a fun time in the old Love Shack tonight! The color, oh the lovely color of this brew was a regal golden amber. Looks pretty, don’t it? Alas, there was no head to speak of. It smelled quite spicy, like pepper, and booze. Yeast and apricots or peaches rounded out the nose for me. Sweet was the order of the day here up front in the taste. Towards the back the spiciness and an orange rind like flavor make themselves known. Mix the whole thing up with a nice bitter bite. 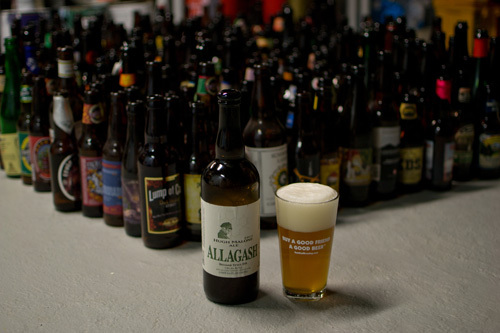 The body was medium, the carbonation was kicking, and the alcohol didn’t hide itself very well at all. This was a sipper for me. This wasn’t bad but if I drank one too many of these, my duties watching the sump pump would have been sorely affected. Rain, rain go away…come on back in about 4 months…then again rain in 4 moths would likely be…snow…yuck! 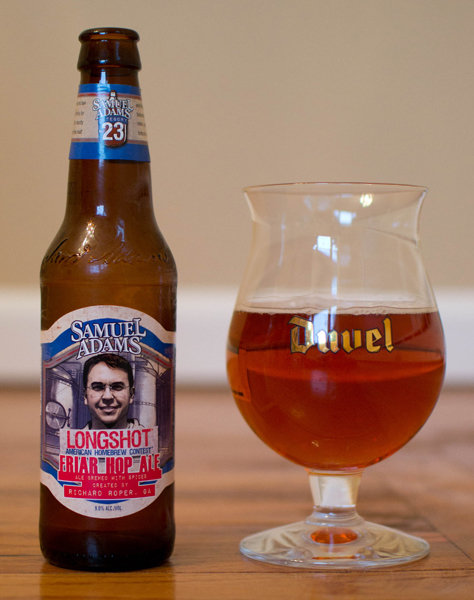 Another Longshot series winner tonight, beer #136 is Longshot Friar Hop Ale by Samuel Adams. This is a Belgian IPA with an ABV of 9%. This winning recipe comes from Richard Roper of Georgia. Lets see if it is as good as last nights Blackened Hops. It said it was a Belgian IPA, so why not use a Duvel tulip for the pour. Look at that amber orange color but wait…where is the head? Alas…it was not to be found here…shame. I swirled and sniffed…spicy, yeast, orange, caramel malts, and alcohol (slightly). Lets taste, shall we? Hmm…bitter, like orange peel, slightly sweet, some sort of spice going on in here, boozy…*sigh*…not doing it for me tonight at all. It lingered, a bit too long with the sweetness and bitterness…and it wasn’t all that pleasant. Medium body and highly carbonated… it felt harsh in the mouth. Took me a while to finish this…not overly drinkable for me. It didn’t get much better coming down to room temperature, well, maybe slightly. This was not nearly as good as the Blackened Hops. If this was one of the Longshot winners, I wonder what some of the losers tasted like. Sorry Richard, this wasn’t for me.